Sambal. I quite know sambal at the back and in front of my cooking hands. Sambal. Made before like countless times (Ayam Masak Merah & Nyonya Fish Sambal). Really, sambal is not a confusing cooking matter for me. In fact, sambal is my favourite. What else should I say when sambal is like smooth sailing cooking for me. 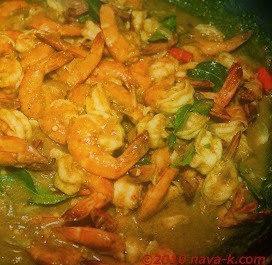 However, this Sambal Udang is not the usual (Sambal Tumis Ikan Pari & Sambal Petai Udang Kering). Not at all. Why? Because its my own. My own coined recipe. What's the difference compared to the rest of the sambal udang? I think I should let you decide. 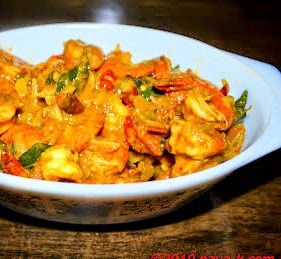 Sambal Udang. Super delicious. Super inviting. Super hunger triggering. In heated oil, saute shallots. Cook till aromatic and oil splits. Add prawns, stir and cook till prawns are cooked to just a right texture. Please do not over-cook. Add lime juice, curry leaves, birds eye chillies, palm sugar and salt. Give a couple of stirs. 1 kg of prawns?? I can imagine the hard work all by yourself. Great turn out, Nava!